If you’re looking for a coffee maker and a coffee bean grinder, did you know you can get them both in the same machine? Having a coffee maker with a built-in grinder will save you countertop space and be of benefit in other ways. Drinking coffee first thing in the morning for the past 50 or so years has taught me that if I wanted coffee with the best flavor, I would be sure to grind the coffee beans right before brewing the coffee. There is no other way to do the grinding immediately before brewing that works better than having a built-in grinder. Like all other coffeemakers, the coffee makers with built-in grinder (also known as self-grind coffee maker) come in several brands. It was difficult to choose the best since many are very similar but there is one we feel is better than all other models. For the best coffee maker with built-in grinder we chose the Cuisinart DGB-900BC Grind & Brew Thermal 12-Cup Automatic Coffeemaker. Besides being very programmable, it is good looking made of state-of-the-art brushed stainless steel with a built-in burr grinder that will grind your favorite coffee beans to perfection before automatically brewing a pot of one of the best tasting coffee. One feature that makes it the best is the charcoal water filter. If you use tap water for making coffee and you don’t like how that water tastes, your coffee is not going to taste as good as it could when using a water filter. The water quality is as important as the coffee quality and the Cuisinart DGB-900BC will remove chlorine and any other bad tastes for a pure cup of coffee every time. The Cuisinart DGB-900BC is programmable with the control panel that has a backlit digital display that highlights the time and program that you set. It has a 24-hour timer for automatic brewing so you can wake up to a fresh pot of coffee. You can program it to be customized to your liking of strong, medium, or mild. This fully automatic and 24-hour programmable coffee maker is versatile in many ways. You can use pre-ground coffee or fill it with your favorite coffee beans and within minutes have a very fresh cup of delicious coffee filling your kitchen with the aroma you love. To use the pre-ground coffee you can turn off the grinder by pressing the Grind Off button before turning on the unit. The maximum amount of ground coffee is 16 level scoops and exceeding the amount could cause an overflow. Instead of needing to buy coffee filters, there is a gold tone permanent filter and it has a filter basket cover. It can be removed for easy cleaning and is safe to be put in the top rack of the dishwasher. The Cuisinart DGB-900BC has a grind-control function to make it easy to set the amount of coffee you want to grind from 2 to 12 cups. The bean hopper holds one half pound of beans and has a sealed air-tight lid to keep the beans fresh and is equipped with a safety lock. It works best when the hopper is filled at lease half way so that you will have enough to grind and brew a full pot of coffee. The thermal double-wall insulated carafe is made of stainless steel and holds 12 cups of 5 ounces each. It will keep the coffee hot for hours so the last cup is as good as the first. There is an brew-pause that stops the flow of coffee for up to 20 seconds so you can fill up a cup before the carafe is filled completely. The carafe is easy to pour, has an ergonomic handle, brewed coffee markings for two to twelve cups and is drip free. The non-stick hot plate will stay warm until it shuts off automatically, which can be set from one to four hours. For all that this coffeemaker does it seems like it should cost more. Just the water filter feature was enough to convince me that it would be worth having. 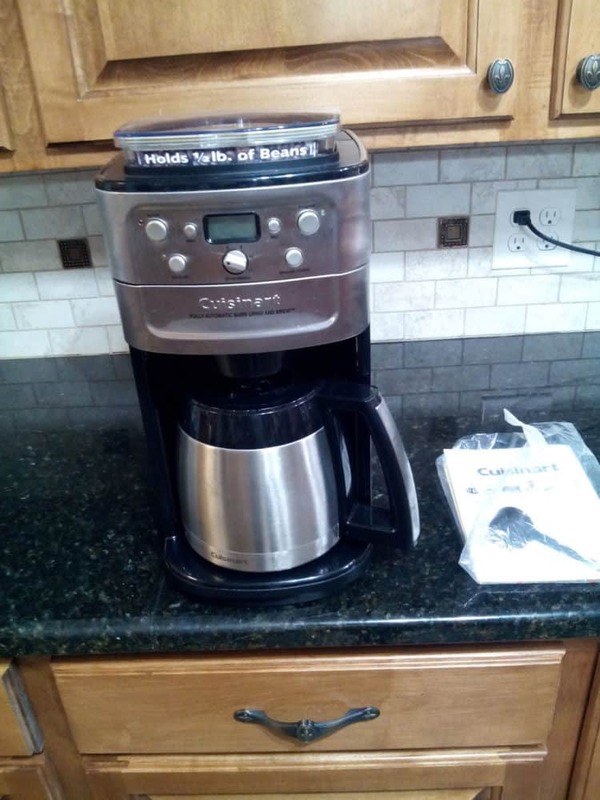 We hope our choice of the Cuisinart DGB-900BC Grind & Brew Thermal 12-Cup Automatic Coffeemaker as the best coffee maker with built in grinder will help you decide if it is the one for you.